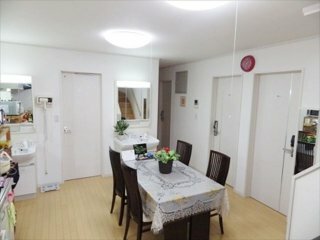 This women only sharehouse is 2 min walk from Ueno Okachimachi station in JR Yamanote Line. Also, you can walk to Ueno station in 8 min where many trains run and metropolitan area in Tokyo. Ueno is famous for Ueno Zoo Park where you can see Panda. Another famous speciality is "Ameyoko" street where many kinds of fast foods shop such as Turkish foods. There are two number keys to enter the house and the room key is also number key, so the security is fine. As this is women only house, the common space are neat and tiny. If you like the house within 5 min walk from the station, we recommend this house!